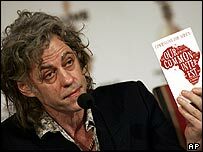 Bob Geldof has said his Live 8 protests will be "a glorious failure" because world leaders will "probably not" agree to all his demands on African poverty. He told the AFP news agency he likes "no part" of organising the concerts and rallies to pressure G8 leaders to improve trade, aid and debt in Africa. "Will that happen? Probably not. So will I have failed? Yes I guess." 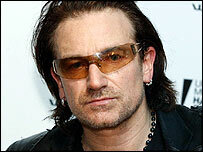 Meanwhile, Bono met European Commission leader Jose Manuel Barroso on Thursday. He told world leaders: "Don't blow it." Bono and Geldof are spearheading the campaign to persuade the planet's most influential people to focus on poverty in Africa. Geldof is staging five concerts across Europe on 2 July, four days before the leaders of the G8 countries meet in Scotland. He is then hoping to mobilise a million people to travel to Scotland to protest. On Thursday, he launched the paperback version of the Commission For Africa, setting out measures he thinks are necessary to start solving problems he says cost 50,000 lives a day. If he does not fully succeed, "we will have tried everything to the last fibre of exhaustion to make it happen and I can live with myself", he earlier told AFP. "It will be, not for me but for everyone involved, a glorious failure." The 53-year-old rock singer said his role was "very demanding". "I really don't want to do it," he said. "There is no part of today that I have liked, not a single part." But he had to try, he said. "For the rest of my life I would have thought 'I could have maybe done that, I could have maybe changed it and I bottled it for personal reasons'." In Brussels, Bono said he was offended by the "stupidity" of the situation in Africa. "There will always be natural calamities, but there are 120,000 lost lives in Africa every month and this is avoidable," he said. "This is not wide-eyed, misty-eyed Irish nonsense - these are achievable goals. I am excited by that. That is what turns me on." He urged leaders to "put down the national flags, look up from the numbers and look to the future". Mr Barroso told Bono a lyric from U2 song Zooropa had inspired an article he wrote about the future of Europe. To applause from Bono, he recited the lyric: "Don't worry baby, it's going to be all right. Uncertainty can be a guiding light."